The Polynesian is the ultimate ode to Tiki, created to honor Tiki’s past and reinvigorate it for generations to come. Led by global Tiki apostle Brian Miller, a veteran craft bartender of more than two decades, The Polynesian is unprecedented in ambition and scope. Located in Midtown West’s new Pod Times Square Hotel (400 West 42nd St.), The Polynesian accommodates 200 guests split equally between its indoor space and outdoor terrace, each with its own full-sized bar. The terrace also offers a spectacular panoramic view of the city. We offer a menu of small bites and delicious cocktails. We do not offer a full dinner menu. For any questions please email info@thepolynesiantiki.com. Our outdoor terrace closes at 11pm Sunday-Thursday, 12am Friday and Saturday. Everyone must be 21 years old with a valid ID. Reservations do not guarantee outdoor seating. If you're in the mood for a bit of whimsy with your cocktails, and are in the otherwise unremarkable eating and dining landscape of Times Square, this is a good choice. Tropical cocktails (some very strong) and a private club atmosphere, with generally very accommodating staff. Prices fairly reasonable for the most touristed area of one of the country's most expensive cities (start at $17 for the fancy drinks). If you love all things Tiki, done superlatively, in a gorgeously decorated setting, this is the place. The best. Great ambiance. Welcoming and festive décor. Had wine but bartenders were making amazing looking drinks. Food was tasty and decent portions! Def recommend! If you are looking for a real tiki bar and restaurant, this is your place. The prices were on the higher end but the food was absolutely delicious and the drinks were fantastic. I loved the bar and decor of the place. Great little escape from the city while in the city. Lovely time, as always. Food was good and drinks were excellent. My whole family enjoyed the atmosphere and food and drink! This is my new favorite bar in NYC. The cocktails are impeccably crafted, the atmosphere is warm and welcoming, and the food is delicious. Definitely will be my go-to when impressing friends and family from out of town! Great food and drinks and our waitress was on point with service. Highly recommend. There were 2 waiters covering our table, one was incredibly nice, the other one was the rudest and meanest waiter I have ever met. Way too loud, faux Tiki ambience, watery expensive drinks. We made reservations way ahead and had the worst table in the joint. Great service. Bar food was decent. Jerk chicken satay stood out. Flavorful and tender. My drink had wayyyy too much ice, so I complained and ordered a second with less ice. They said they couldn’t alter the drink, but my drink arrived with less ice. I guess they have to say that but they will try to accommodate your requests for changes. Ambiance and decor was reminiscent of colonial European decor with reggae music. Service once seated us excellent. Front desk host was very slow. The food was mediocre at best. A return to Trader Vic’s could have been fun but this place doesn’t really even try. The soundtrack was loud Carribean music which hardly rates as Polynesian. There are lots of silly drink choices at high prices. A real lost opportunity. This hidden gem on 42nd st should be another tourist trap BUT ITS NOT! It's an amazing little gem with true tiki drinks and mixologists who sure know what they're doing. I only wish they had more food options! The appetizer we got was crab Rangoon and it was incredible, but small as expected for the price (real crab tho!). Highly recommend this...ambience is awesome too feels like Hawaii!!!! Tiki drinks were so good I was sad to finish mine! What a great treat in an area with not a lot for New Yorkers! Although very pricey, the experience was nice and the ambience was excellent. We shared a $44 cocktail in a konch shell, spicy fries and spicy chicken, both of which were very tasty (but definitely made us more thirsty). The pictures don't quite do the place justice. They've created a very cool space and vibe. The drinks were delicious and expertly prepared. The food was fine and served quickly. I'm more than okay with less than healthy options, but my lady friend would have liked another healthier option or two on the menu. The scene and the cocktails are the main reason to visit and both were definitely worth the effort. This place was nothing special. Service was sub par and the waiter didn't really want to recommend a drink. The food and drinks were expensive. Staff was very nice and helpful. Our server helped my group decide what would fit our taste best. She was very knowledgable. Drinks were creative and presented in creative ways. 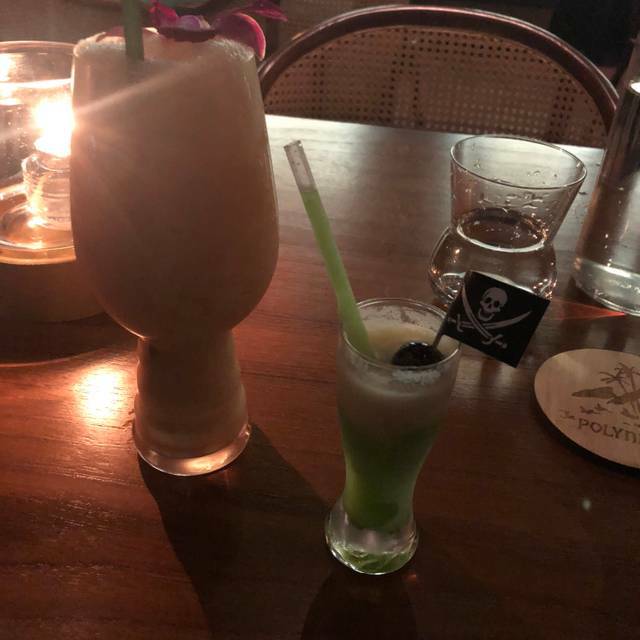 Delicious drinks, amazing service! Great place to bring a date or meet up with a friend for some drinks and snacks. The drinks are fantastic!! Everything is pricey, but the drinks are worth the price tag. Flavorful and unique. One of my waiters knew the drinks extremely well and was very helpful in making my decision. The fries are good too! We had the coconut shrimp app which was good and a couple of cocktails which were great. All staff were very personable. I just thought everything was a bit over priced otherwise we would have ordered more food and I wouldn’t have switched to beer after 1 cocktail. Came here based on a friends suggestion. It was worth the experience but not worth a return visit.... unless there was a happy hour or bar discounts. Love the menu, drinks and Ryan the waiter the best! Though we had a difficult time making reservation because there is no phone number listed on their website we managed to get one after going back and forth and cc’d with a different individual just to make the reservation and changes. When we got there the table was only set up for 8 and my reservation was for 12. After asking a few times, they seated us at a bigger table. I asked our waiter if he could do three diferent tabs and he said he would figure it out at the end. Not exactly what we were hoping for. He also neglected to take the food order for five people at the table so everyone got their food except the five of us and granted it was my birthday. So yeah that was strange. Most of my guests were disappointed in him as he seem a bit stressed but I understood. Being a server I’m pretty lieneient that way. The GM bartender was very nice and gave us a complimentary shot of Pina colada when we arrived. It was so strong I think I was buzzed after drinking it and the Bourban soak cherry. Overall I’d say the food was just ok as the coconut shrimp didn’t really have coconut on it, disappointed that the pupu-platters didn’t have fire, but loved the cucumber salad and tuna poke. I was wondering about the chicken satay as I’ve always had it with a peanut dipping sauce and this was some kind of white sauce and the chicken didn’t seem like it was marinated either but it was still good. I’m a chef so maybe I’m a bit of a critic. Overall we all had a great time and the drinks were pretty fabulous. Love the mugs and glasses too! We will definitely be heading back for more. I found management to be very friendly to make sure my bday celebration was special. Service was terrific. Drinks were amazing. Drinks and food were good, but you have the absolute rudest host who shouldn’t be in that position (he is tall, slender, shaved head). As the first face that greets guests upon arrival, it’s unfortunate that you have such a rude and arrogant person manning the host stand - not one smile, hello, welcome, thank you, explanation of when we would get seated, or hospitable gesture. One person in our party arrived early and was waiting at the bar; this host just starting barking a list of random names at us (I wasn’t sure why he was listing all of these names; I think he was trying to ask what my friend’s name was...but didn’t explain what he was doing and continued to be rude and name random names, none of which was my friend’s). I asked him if he meant what is MY name for the reservation, which I told him was Jessica, and he sternly barked again “I KNOW YOUR NAME.” He walked us into the bar area where my friend (who’s name is Liz, if he would’ve been so kind enough to just ask) without saying anything and plopped is there and started to leave. I asked, “do we wait for the rest of our group here?” And without a smile, just angrily said “we’ll bring them to you” without looking at me and continued to walked away. A huge damper on an evening that we thought would be fun. He’s the host of a tiki bar...its supposed to be fun...but sadly he was an awful representation of hospitality and what a host should be. Thoroughly enjoyed my birthday get together . The staff was fun and very attentive. I would recommend the exotica punch bowl for groups , but you can't go wrong with any of the drink selections, they're all strong & flavorful. As for dining , the fries & jerk chicken skewers were my personal favorites ! Go for the drinks and Ambiance. Cute spot, nice decor. Drinks are amazing!